“Happiness is like manna; it is to be gathered…and enjoyed every day. We have to go out of ourselves…to gather it, since it has rained down from a Heaven at our very door.” ~ Tryon Edwards (American theologian 1809-1894). Yesterday’s blog about fickle Mother Nature made me think of a film that is currently playing in theatres across the country. 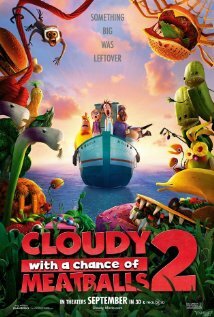 The title of it, Cloudy with a Chance of Meatballs 2, sounds like a description of our country’s political and economic landscape at this moment, but I assure you, the storyline is quite different. The book Cloudy with a Chance of Meatballs is manna for the soul. I must have read it to my son a hundred times or more, over the course of his growing up. It was a favorite and we returned to it time and time again, especially when we wanted to end the day on a positive note. I could probably recite the text by heart. The illustrations in the book made us laugh – images of Mother Nature releasing storms of mashed potatoes, meatballs and spaghetti. There were memorable pictures of torrential downpours of salt and pepper, people being flattened by flying hamburgers. Despite the chaos, the governing body in the town of Chew and Swallow didn’t shut down. The plow trucks were out removing piles of peas and carrots blocking the streets and making order out of mess. They were working hard to solve the problems and change the landscape from rotten eggs clogging progress to a more sunny side up environment. Now that I have been involved in writing and publishing, I see the book as a great example of how an author, Judi Barrett, used her imagination to create a wonderfully entertaining story for both children and adults. Ahh… the days of reading bed time stories. My son, Marc, is now twenty-five years old, and a filmmaker specializing in visual effects. He also works as a film colorist. A perfect way to spend a holiday evening would be to watch this film and escape to the fictional town of Chew and Swallow together where we can look in on his world, and he will have fun providing feedback about the movie. I think I’ll put the DVD on my shopping list for Christmas…..sshhhhh…don’t tell Marc. Here is where to purchase the movie if you can’t catch it at the theatre. http://www.imdb.com/title/tt1985966/ .